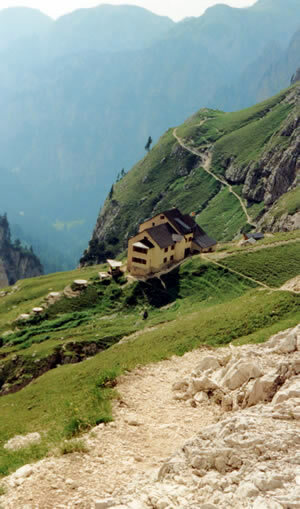 Friends have expressed interest in the hut-to-hut walking holidays we go on and the places we go to. This section of my site is for those friends, and anyone else who stumbles in here. What I've done is to bring together all the detailed plans I could find, and/or references to books containing those plans. These can be used for designing your own holidays. Naturally these plans were designed for us and you would need to do quite a lot of additional work to create a plan that would work for you. But I hope these pages give you a good starting-point. We haven't always followed the plan exactly. A lot of the information will be out of date by now, for example timetables, prices, links to other web sites, etc. There is a lot of detailed information that you will find irrelevant, but it was easier for me to leave it in than to take it out. Walking times in hours are "official" times which we have found to be approximate and optimistic (in the Alps) or pessimistic (in Norway and NZ). I haven't written encouraging descriptions of individual holidays because they were all excellent and I'd strongly recommend any of them. See my home page for contact information. The Rätikon & Silvretta [11 days] New (2014)! Historic routes [17 days] New (2014)!